Fantasy and realism are two great tastes that don't always taste great together. Consider low-tech melee weapons such as axes, swords, and whips: Many gloriously fantastic designs wouldn't work well – or at all – in reality. 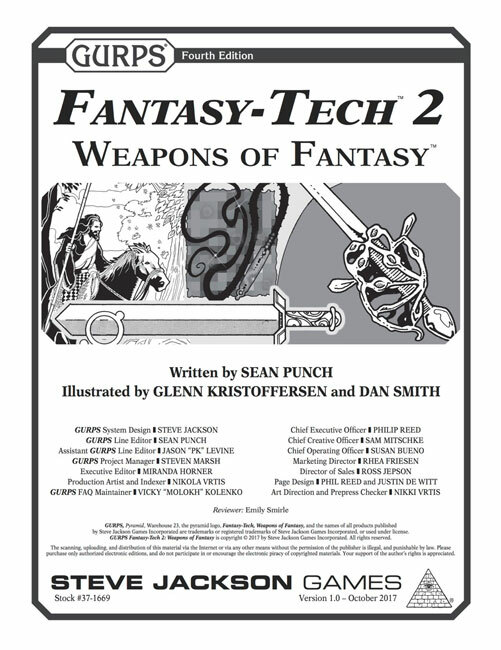 GURPS Fantasy-Tech 2: Weapons of Fantasy embraces the far-fetched. It presents eight crazy weapons that work thanks to magical materials, fantastically skilled smiths (or warriors! ), or the Rule of Cool. Outfit your heroes with weaponry that's outsized, festooned with extra blades, hollowed out and filled with death and danger, and more. Why fight like a mook when you can fight like a boss? For more impossible possibilities, check out the entire Fantasy-Tech line. 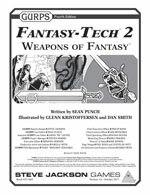 The weapons of Fantasy-Tech 2 are especially well-suited for GURPS Dungeon Fantasy campaigns.